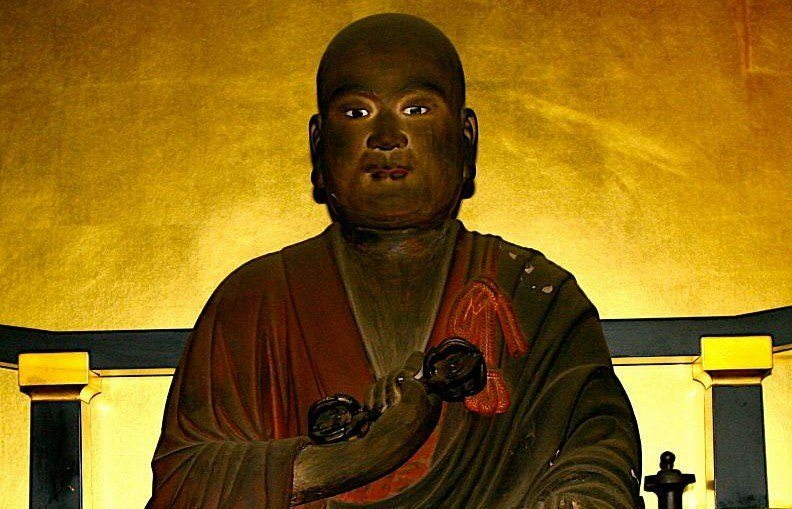 Sokushinbutsu may be self-discipline at its most extreme. Between 1081 and 1903, around 20 living Shingon monks successfully mummified themselves in an attempt at sokushinbutsu, or becoming “a Buddha in this body.” Through a strict diet foraged from the nearby Mountains of Dewa, Japan, the monks worked to dehydrate the body from the inside out, ridding the self of fat, muscle, and moisture before being buried in a pine box to meditate through their last days on Earth. While this event may seem particular to Japanese monks, many cultures have practiced mummification. This is because, as Ken Jeremiah writes in the book Living Buddhas: the Self-Mummified Monks of Yamagata, Japan, many religions around the world recognize an imperishable corpse as a mark of exceptional ability to connect with a force which transcends the physical realm. While not the only religious sect to practice mummification, the Japanese Shingon monks of Yamagata are among the most famous to practice the ritual, as several of their practitioners successfully mummified themselves while still alive. Seeking redemption for the salvation of mankind, monks on a path toward sokushinbutsu believed this sacrificial act — done in emulation of a ninth-century monk named Kükai — would grant them access to Tusita Heaven, where they would live for 1.6 million years and be blessed with the ability to protect humans on Earth. Needing their physical bodies to accompany their spiritual selves in Tusita, they embarked on a journey as devoted as it was painful, mummifying themselves from the inside-out to prevent decomposition after death. The process took at least three years, its method perfected over centuries and adapted to the humid climate usually unsuitable for mummifying a body. In order to begin the self-mummification process, the monks would adopt a diet known as mokujikigyō, or “tree-eating.” Foraging through nearby forests, practitioners existed only on tree roots, nuts and berries, tree bark, and pine needles. One source also reports finding river rocks in the bellies of mummies. This extreme diet served two purposes. First, it began the body’s biological preparation for mummification, as it eliminated any fat and muscle from the frame. It also prevented future decomposition by depriving the body’s naturally-occurring bacteria of vital nutrients and moisture. On a more spiritual level, the extended, isolated quests for food would have a “hardening” effect on the monk’s morale, disciplining him and encouraging contemplation. This diet would typically last for 1,000 days, though some monks would repeat the course two or three times to best prepare themselves for the next phase of sokushinbutsu. To begin the embalming process, monks may have added a tea brewed of urushi, the sap of the Chinese lacquer tree, as it would render their bodies toxic to insect invaders after death. At this point not drinking anything more than a small amount of salinized water, the monks would continue with their meditation practice. As death approached, the devotees would rest in a small, tightly cramped pine box, which fellow votaries would lower into the ground, about ten feet below the Earth’s surface. Equipped with a bamboo rod as an airway for breathing, monks covered the coffin with charcoal, leaving the buried monk a small bell which he would ring to notify others that he was still alive. For days the buried monk would meditate in total darkness, and ring the bell. When the ringing stopped, above-ground monks assumed the underground monk had died. They would proceed to seal the tomb, where they would leave the corpse to lie for 1,000 days. After unearthing the coffin, followers would inspect the body for signs of decay. If the bodies had stayed intact, monks believed that the deceased had reached sokushinbutsu, and would thus dress the bodies in robes and place them in a temple for worship. Monks gave those showing decay a modest burial. The first attempt at sokushinbutsu took place in 1081 and ended in failure. 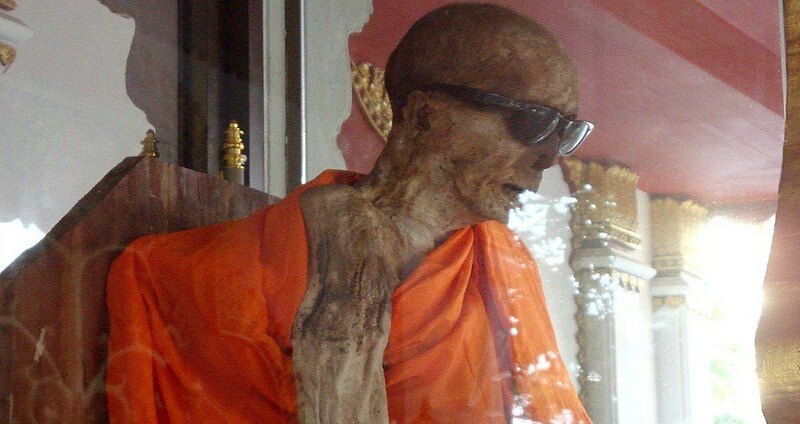 Since then, a hundred more monks have attempted to reach salvation by self-mummification, with only around two dozen succeeding in their mission. These days, no one practices the act of sokushinbutsu as the Meiji government criminalized it in 1877, viewing the practice as anachronistic and depraved. The last monk to die of sokushinbutsu did so illegally, passing years later in 1903. His name was Bukkai, and in 1961 researchers at Tohoku University would exhume his remains, which now rest in Kanzeonji, a seventh-century Buddhist temple in southwest Japan. 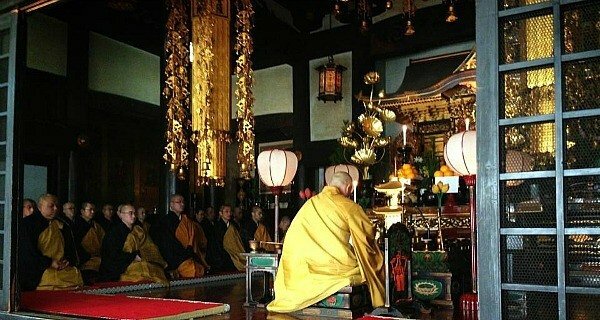 Of the 16 existing sokushinbutsu in Japan, the majority lie in the Mt. Yudono region of the Yamagata prefecture. For more global perspectives on death, check out these unusual funeral rituals from around the world. Then, have a look at bizarre human mating rituals that will challenge your notions of romance.